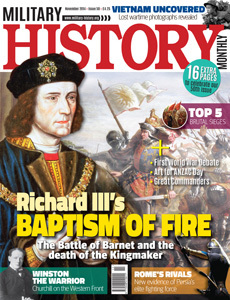 The November issue of Military History Monthly, the British military history magazine, is on sale today. MHM deconstructs the 15th-century dynastic struggle between the rival houses of Lancaster and York, with a special focus on the Battle of Barnet in 1471, a study of the strategy and tactics of the time, and a character-analysis of the vilified King Richard III. Stephen Miles explores a seminal period in Churchill’s life when he served as first a cabinet minister, then a battalion officer. British soldiers encounter the German trenches in 1914. Hugh Macdonald-Buchanan investigates. Yamashita – Greatest Japanese commander of WWI? Graham Goodlad assesses the military career of ‘The Tiger of Malaya’. Kaveh Farrokh evaluates new evidence surrounding the military achievements of the Sassanids. Also in this issue: Behind the Image, Thinkers at War, War Culture, Museum Review, War on Film, Event Listings, Book Reviews, Top 5, and much more. It lasted three hours, from dawn until breakfast, and the heavy fog never lifted that day in 1471. When it ended, ‘the Kingmaker’ was dead, the Lancastrian cause shattered, and Edward of York confirmed on his throne. Did the Battle of Barnet matter? Were not the Wars of the Roses a clumsy dynastic struggle between two selfinterested aristocratic factions? Our special this month explores these issues and the English art of war in the late 15th century. It also offers a thorough analysis of Barnet, taking us to the heart of battle as experienced by the archers, gunners, and men-at-arms. Among those men was the 18-year-old Richard, Duke of Gloucester, the future King Richard III, fighting his first battle, in command on the Yorkist right. How did he fare? And, more generally, how should we judge him in the context of his age and of the war that both created him and ultimately destroyed him? Also this issue, Kaveh Farrokh analyses the Sassanian Army of Late Antiquity, which proved itself a match for the armies of Imperial Rome, though representing a different military system based on shock cavalry and massed archery. on the Western Front shaped the future war-leader. Finally, continuing our occasional ‘Great Commanders’ series, Graham Goodlad assesses the career of Tomoyuki Yamashita, the Japanese general responsible for the 1942 fall of Singapore.